It's only once in a blue moon there's an opportunity to photograph a full moon on two different occasions within the same month. There's no pun here. When there are two full moons in the same calendar month it's actually called a blue moon. Due to the moon's 28-day cycle it only happens once in a while – therefore as the saying goes, once in a blue moon. I was able to get an even rarer opportunity to photograph the blue moon from opposite corners of the country - first in the south west, at the White Sands National Monument in New Mexico on Jan 1st 2018, and then again in the north east, in Boston, this past Wed Jan 31st 2018. The full moon this past Wed, Jan 31st was extra special - a super blue blood moon. A rare trifecta of lunar events happening all at once that was last seen in the US in 1866. This moon is considered super being especially close to the Earth due to it's elliptical orbit, appearing larger and brighter than usual. We also had a lunar eclipse happening, so it's passing through the Earth's shadow caused the moon to appear a deep red color. And hence the blood moon. This first set of images below are from the full moon during moon rise at the White Sands, NM on Jan 1st. A full moon rises over the Sacramento Mountains and the White Sands National Monument, NM as the setting sun casts a warm glow over the sand and two yucca plants in the foreground. 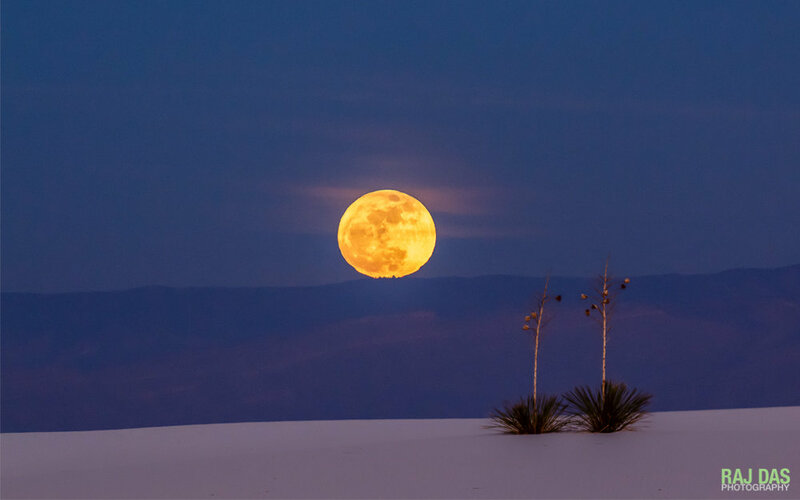 A full moon over the Sacramento Mountains and the White Sands National Monument, NM. The second set of images are of the moon during moon set and the Boston skyline with the Prudential tower and dome of the First Church of Christ, Scientist. The partial eclipse is visible on the top left of the moon. 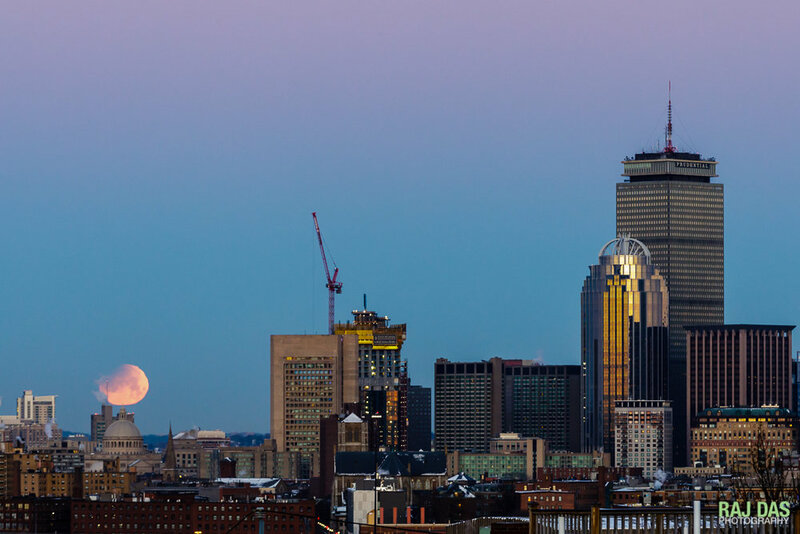 A super blue blood moon sets as the rising sun casts a warm glow over the Boston skyline with the Prudential tower visible on the right. A close shot of the super blue blood moon with the dome of the First Church of Christ, Scientist in Boston visible in the center of the frame. A close shot of the setting super blue blood moon with the Boston skyline and dome of the First Church of Christ, Scientist visible. 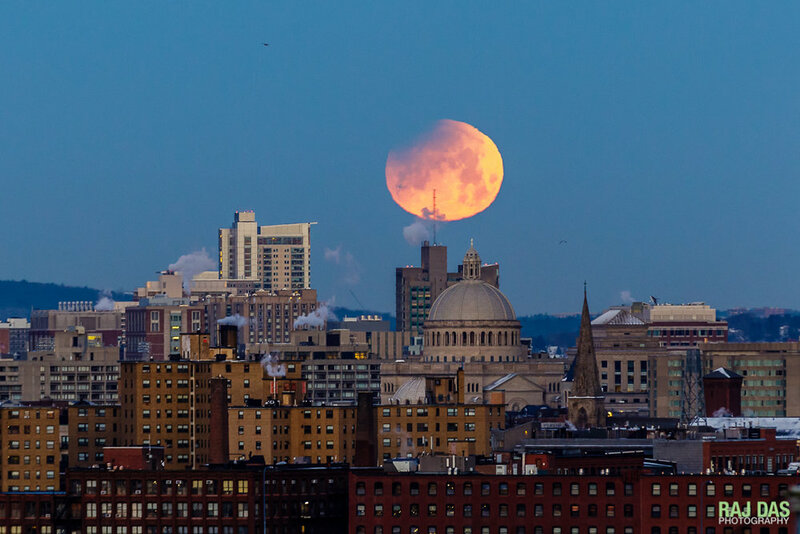 A super blue blood moon sets just as the sun rises in the opposite direction casting a warm glow over the Boston skyline. According to NASA we'll get another opportunity to see a super blue blood moon in the US in another 19 years on Jan 31st 2037.